From Xunantunich, Robin took us zip-lining and cave-tubing. Jake doesn’t like heights; I don’t like closed spaces. Therefore, it was another day of conquering fear. Once we got started, Jake loved the feeling of flying through the air (as did I). Once I got over the pitch-black water, cave-tubing wasn’t all that bad either. I was sort of proud of myself: snorkeling, bike-riding on the edge of the ocean, and cave-tubing. Things I never would have expected myself to do, and yet, I did all of them. For the drive home, Jake and I were given a gargantuan pitcher of Rum Punches to share. They may have been the best drinks we had all trip, or maybe it was the exhaustion, excitement, and adrenalin that made them so sweet. John, Ashley, Byron, Jake, and me. Prince is surely running around somewhere, too. Once back on the island, Byron and Prince picked us up. First, they drove us to a local bar, which consisted of an unmarked pink building with no windows. Sure, we got a few weird looks walking in there, but we picked up two local beers called Belikin (yummy stuff) and headed to their next destination. Randomly, they had to pick up John and Ashley (the father-daughter duo from Rojo), but instead of picking them up and going somewhere else, we all stayed at their hotel and drank the night away by the pool. I was amazed by the synchronicity. Apparently, Byron and Prince had already befriended John and Ashley, just as we had. Small island, yes? We learned a bit of African creole that evening, with Prince’s help. (For instance, a “sheh-lye baby” refers to a baby you’re not sure is yours. Get it? “She lie.”) While enjoying myself, I at one point glanced at Byron and Prince, wondering if they had places to be, people to see, but then I remembered Belize Time—an unfamiliar time zone that worshiped fun, friends, and spontaneity. How I loved Belize Time! Those dark shadows? Those are sharks. The next afternoon, Saturday, I came upon the most amazing test of my resolve yet. We were to take a boat and go snorkeling in Hol Chin Marine Reserve, featuring (gulp) Shark Ray Alley. Was I ready? Uh, sort of. Once I got there, did I hop right in? Strangely, yes. I was right up there with our guide! 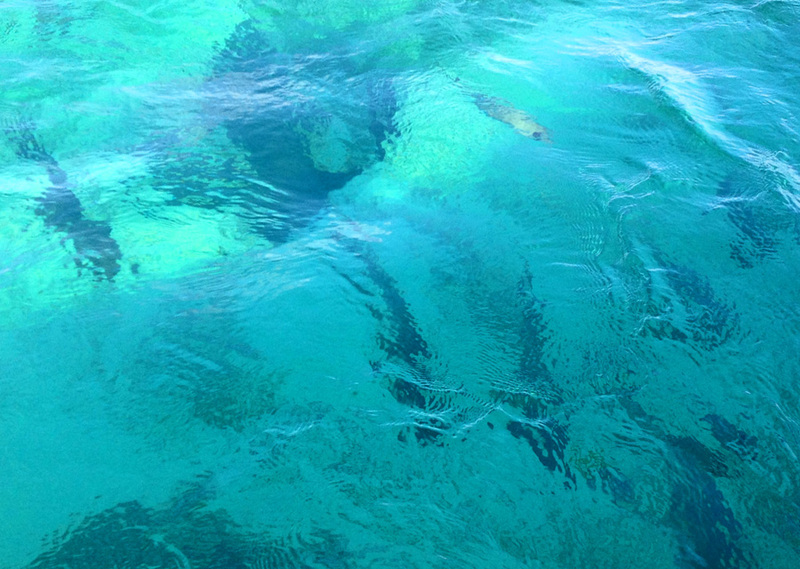 I felt an amazing rush, wearing my flippers and face mask, as I coasted over thirty-foot-deep splits in the reef. A couple times, I swam down deep with our guide to closely investigate schools of mysterious fish, camouflaged by reefs and dark water. Sure, when our guide tried to play with a bright green moray eel, I shied away. But when he took us to Shark Ray Alley, I had a true out-of-Sara experience. We swam with sting rays! Huge sting rays, bigger than your arms can reach. We pet nurse sharks! Lots and lots of them. In wonder, I watched them scurry below me. I even dove a couple times and tried to grab one. What was wrong with me? I was on Belize Time, dang it! Where excitement and fun ruled the day! In hindsight, the experience of swimming with things that scared me was my favorite experience. I can’t wait to go snorkeling again! It was the super, super full moon that night, and we watched it rise from a beach bar with our new family: John, Ashley, Byron, and Prince. We ran around San Pedro’s “Central Park” that night, drinking rum in the golf cart. We had the odd experience of a Belizean Gentleman’s Club, and Jake was chased by crazy San Pedro puppies. Dogs were everywhere in Belize. Practically everyone owned one, and the strays ran rampant. We became particularly close with our resort’s dog, Portia. I suppose we became particularly close with everyone we met there. Chillin’ on the pier hammock. Our last full day (no! no! ), Jake and I shared a couple’s massage on the pier outside the Capricorn Resort. 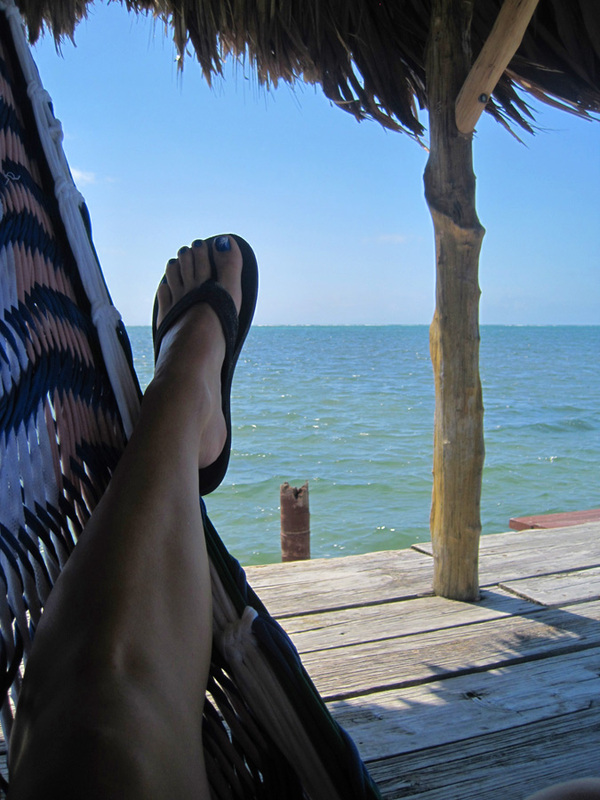 It was strange being practically naked on a pier with boats flying by, but eh, it was Belize. Why not? Following that uber-relaxing experience, we spent the day bar-hopping down the beach on our bicycles. 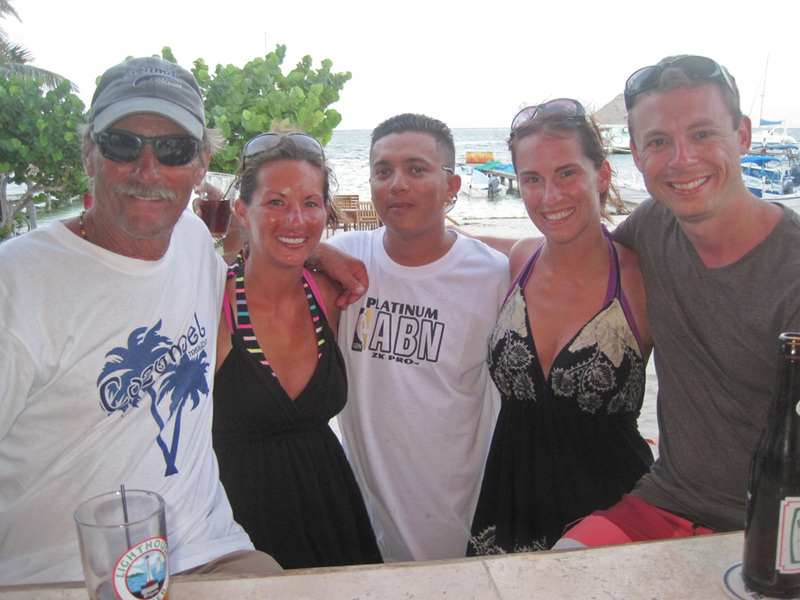 We said goodbye to Palapa (my favorite bar, probably because I could drink beer while floating in the ocean). 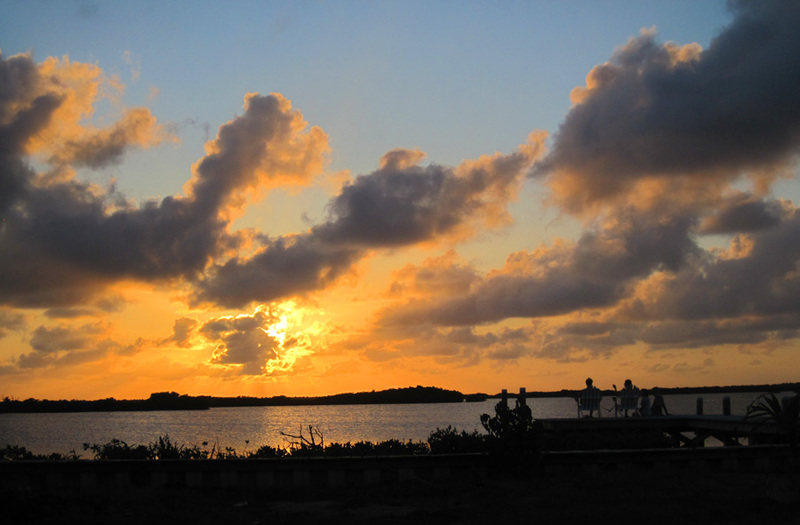 We said goodbye to the sunset on the west side of the island. The next morning, we said goodbye to Byron and Prince over lunch and promises of Facebook friendship. That’s when Prince called us “family,” and amazingly, that was exactly how I felt. I didn’t want to leave Belize. I could have stayed there forever. I have never felt so relaxed, so at peace, and so filled with life. Yesterday, Jake said to me, “That wasn’t a vacation. That was a life-changing experience.” Yes, honey, it was. Here is the challenge: how do we bring Belize back to Phoenix? Eventually, yes, there is a distinct possibility we could retire there, and yes, we plan on making it a bi-annual trip. But what about right now? How do I bring Belize home? First off, smile at people. Even strangers. All the time. Because why not smile? Next: who cares if something takes a while? Relax, mon! It’s all good. Never put a time limit on fun. Who needs a TV? Instead, go watch the sunset. All of the things above are important, but most important? Live in Belize time. Slow down. Go with the flow … because the flow can take you to really cool places. Sounds like you had fun and created a lot of memories. The world is full of slow, beautiful places just waiting to be discovered. When I worked for Club Med, I was always asked what my favorite was. In truth, each club, each beach, each tropical paradise had it’s charms. I am so glad you have experienced this one. There are many more to go. You’re coming with us next time. And Dad. And Matt.